Definition at line 16 of file CQAnimationSettingsEditor.h. 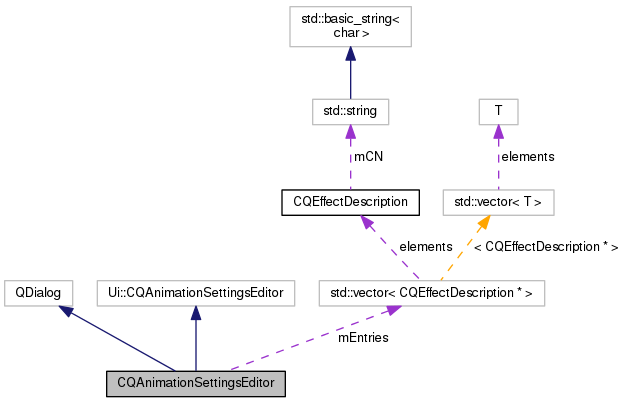 Definition at line 10 of file CQAnimationSettingsEditor.cpp. Definition at line 16 of file CQAnimationSettingsEditor.cpp. Definition at line 60 of file CQAnimationSettingsEditor.cpp. References CQEffectDescription::getCN(), CQCopasiAnimation::getEntries(), CQCopasiAnimation::getScaleMode(), CQCopasiAnimation::Global, and mEntries. Definition at line 32 of file CQAnimationSettingsEditor.cpp. Referenced by saveTo(), and slotSelectionChanged(). Definition at line 84 of file CQAnimationSettingsEditor.cpp. References CQCopasiAnimation::Global, CQCopasiAnimation::Individual, saveChanges(), and CQCopasiAnimation::setScaleMode(). Definition at line 24 of file CQAnimationSettingsEditor.cpp. Definition at line 28 of file CQAnimationSettingsEditor.cpp. Definition at line 20 of file CQAnimationSettingsEditor.cpp. Definition at line 43 of file CQAnimationSettingsEditor.cpp. References mEntries, mLastSelection, and saveChanges(). Definition at line 31 of file CQAnimationSettingsEditor.h. Referenced by initFrom(), saveChanges(), and slotSelectionChanged(). Definition at line 32 of file CQAnimationSettingsEditor.h. Referenced by saveChanges(), and slotSelectionChanged().